Stormwater management is an evolving, complex challenge facing jurisdictions across the country. Both rural and urban areas have increasing concerns about the destructive power of water such as flooding, erosion, and water quality related issues. But with proper planning, stormwater management challenges can become opportunities to improve the overall health of aquatic systems. As a natural resource and an integral part of the water cycle, stormwater must be preserved and protected. We take this responsibility seriously—bringing together industry best practices, design standards, and the natural environment to create smart, right-sized solutions. Our team of engineers, environmental scientists, planners, and certified floodplain managers specializes in stormwater management planning with a full range of associated services. We don’t believe in “one size fits all” solutions. From developing innovative designs to using tried and true methods, we tailor our recommendations specifically for your site, needs, and budget. Lasting client relationships, built on a philosophy of responsive, personal service, allow us to develop an intimate knowledge of local stormwater and water quality issues. A strong understanding of the environment, geographical area, and local jurisdiction needs have created an unmatched depth of project experience. Historically, stormwater management planning was handled jurisdiction by jurisdiction with little regard for watershed boundaries. Guiding the development of Watershed Management Authorities, we’ve witnessed the power of jurisdictions coming together to improve water quality and reduce flooding. 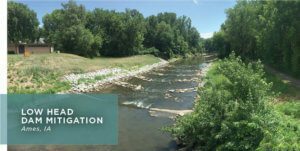 We’re proud to help facilitate these improvements and are excited to apply our experience in assisting other watersheds. Utilizing the latest research to develop creative solutions is important to improve water quality. A critical part of this is educating the public and other stakeholders because improving water quality is a collaborative community effort. It’s not easy, but we’re committed to applying our planning, environmental science, landscape architecture, and engineering expertise to help you solve complex water quality issues. Sometimes, hard infrastructure is the most appropriate and practical solution. But, considering other stormwater management practices can help maximize limited resources, resulting in a system that’s an amenity instead of just infrastructure. Close working relationships with the U.S. Army Corps of Engineers (USACE) and state and local floodplain regulators helps us mitigate potential permitting issues and gain important insight on proposed projects. Identifying and addressing potential floodplain issues early on during project development helps us navigate the regulatory process. Stormwater collection systems usually operate “out of sight and out of mind” until they’re pushed beyond capacity and flooding occurs. Drainage systems installed decades ago may still be in good structural condition. Yet, ongoing urban development and changing weather patterns that produce intense rain can result in infrastructure that is undersized for today’s conditions. While designing a single storm sewer, culvert, or drainage ditch is straightforward, analyzing an entire drainage network and the interaction between components for different rainfall events is complex. 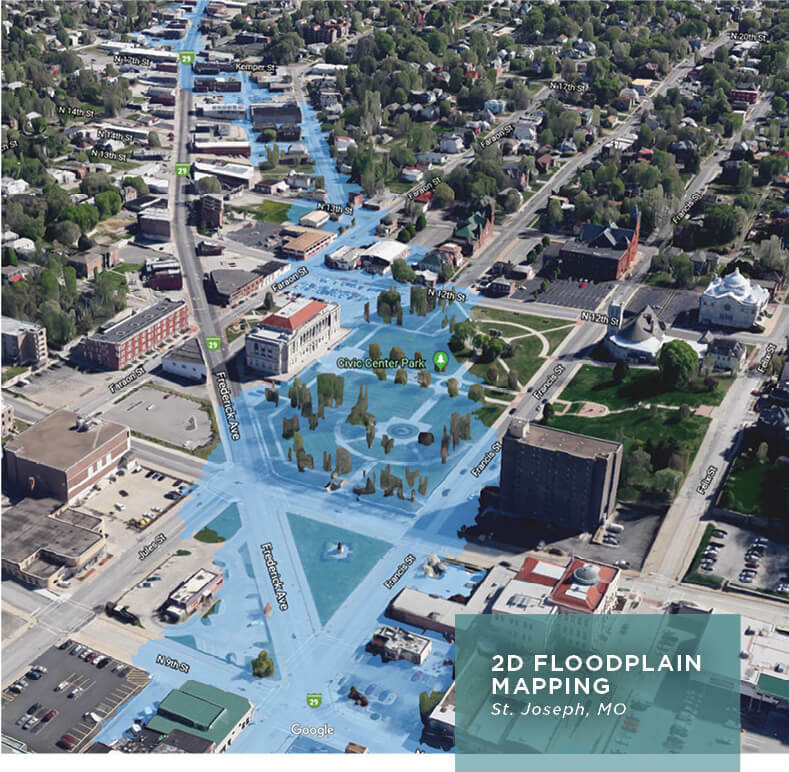 The powerful capabilities of advanced hydraulic and hydrologic modeling software help us identify and optimize proposed drainage system improvements. Intake placement, pipe size, and storm sewer outlet locations are designed for maximum system efficiency while keeping project goals and future needs in mind. Putting stormwater management plans into action can be daunting when comparing project costs and available budgets, but numerous funding resources can help. We’ve guided clients to obtain funding for stormwater improvements through multiple sources including the (Iowa) SRF sponsored projects program, local soil and water conservation district grants, and the FEMA Hazard Mitigation Grant Program. Our experience also includes assisting with local stormwater utility development. This extremely useful community tool can provide a long-term funding stream for addressing drainage and water quality issues.